Probably four years ago or so I was really craving my mom’s meatloaf sandwiches or at least the idea of them…the loaf, mayo, ketchup and dill pickle. I figured making a vegan loaf would be pretty easy but I wasn’t sure where to start or how to make it stick together so I started searching the web. This search led me to The Magical Loaf Studio. It was a dream come true. It’s interactive. The loaves can be made out the ingredients I have at home. Plus I can change it every time (which I do.) So many possibilities! On a side note it is very easy to make it gluten-free. I would like to say at this time that I am not affiliate with the Seventh Day Adventist (though I love their grocery store in Loma Linda.) By posting this link I am not trying to promote religion or recruit new members. I simply love this site, have been using it for years and want to give the creator Jennifer McCann props for such an amazing creation! To have fun and create your own loaf click this link: The Magical Loaf Studio. Below I will post the ingredients I used for my magical loaf including any changes I made to the recipe. My loaf came out delicious but it didn’t stick together as well as some of my previous loaves. I used flax meal for the first time. Also it is the first time that I used uncooked oatmeal instead of rice. 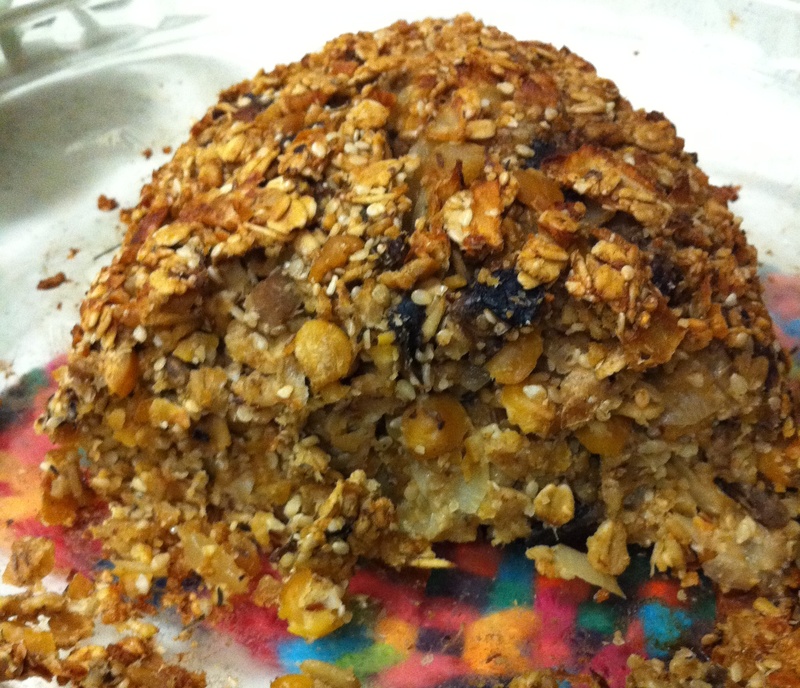 The center stuck together well but the outside was crumbly. I cooked according to directions on the site. If you make your own let us know what you used and how it came out! 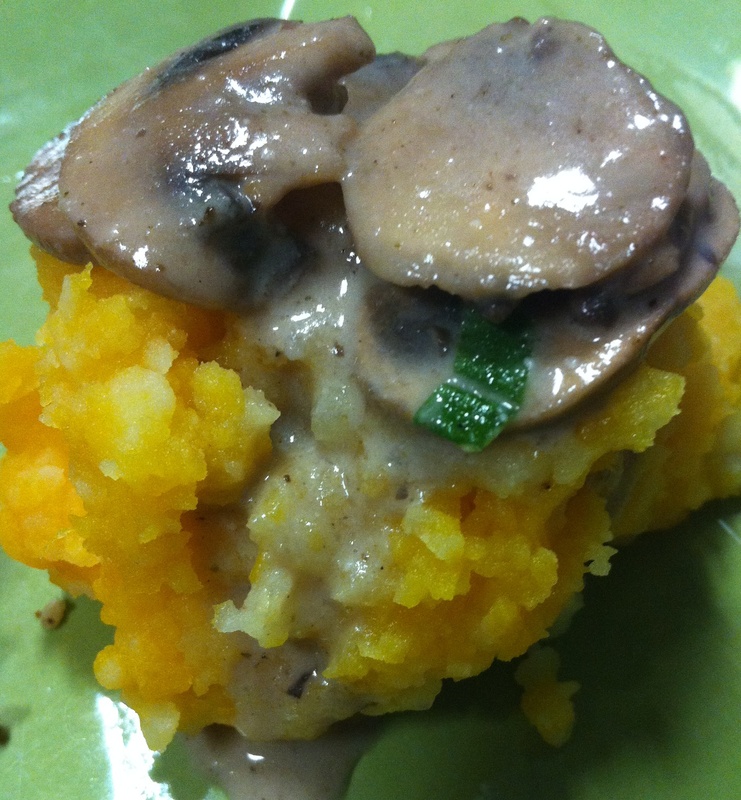 Picture with the loaf is butternut squash and potato puree with mushroom sage gravy. Make butternut squash and potatoes separately by boiling until soft enough to mash. Then either mash each separately or put in food processor separately. Add nutmeg, butter and nutritional yeast to potatoes. Fold squash into potatoes but don’t blend completely so that there is still a separation of squash and potatoes. 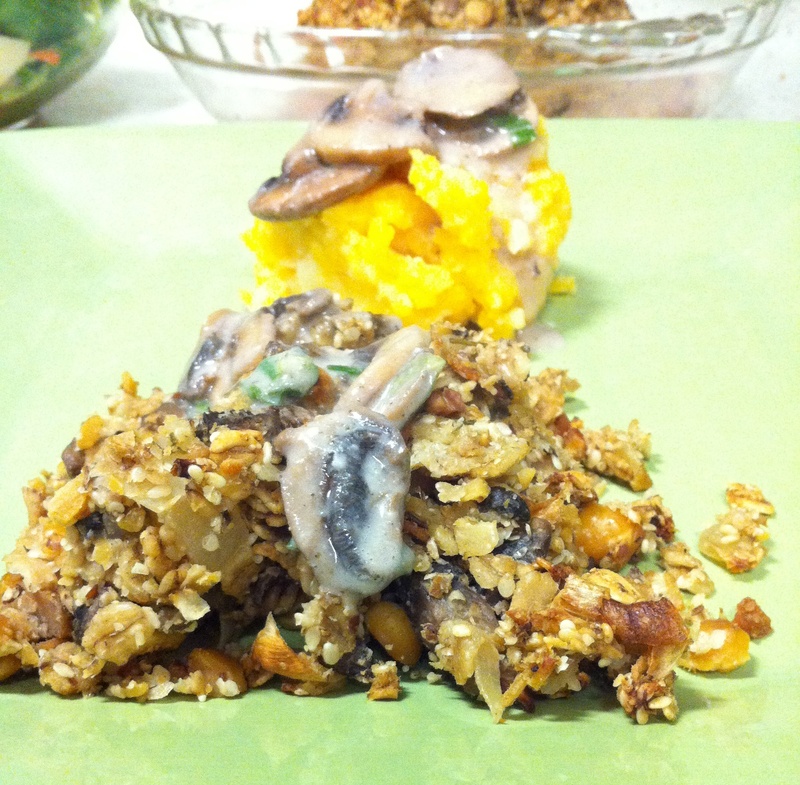 Recommend serving with Mushroom Sage Gravy.